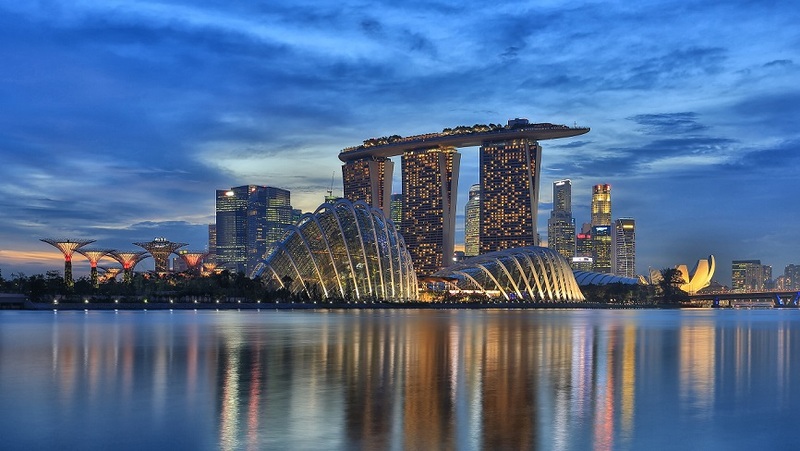 Singapore’s downtown core is where you want to stay if you only have 48 hours in this amazing city. There is so much to see and do here and most of it within walking distance. Now a landmark in the Singapore skyline, the hotel looks like a ship floating high above the city. The Marina Bay Sands is a city within a city, with a convention center, science and art museum, shopping, restaurants, entertainment, casino, skating rink, an underground canal complete with Sampan rides, and let’s not forget, the SkyPark, which spans the three towers of the hotel. From the SkyPark you will be treated to one of the best views in the city and the busy harbor below. Even by day the view is staggering, the bay area is very well designed and architecturally interesting. Catch the sunset from the 500ft infinity pool or the lounge. If you are there in the evening, this is a perfect vantage point for the laser show or just to look out at the expanse and sparkle of city lights. The hotel is located in one of the best areas for sightseeing, just step outside and walk the sea walk all the way around the inlet to pose for a picture with Singapore’s iconic Merlion (a half-lion, half-fish creature). Wander over to vibrant and bustling Chinatown and visit Singapore’s oldest Hindu Temple, Sri Mariamman, created in ornate Dravidian style. Discover the neo-gothic beauty of St. Andrew’s Cathedral. Meander through the calming and educational Botanic Gardens. Founded in 1822 this 74 acre park has survived many re-inventions but is quickly becoming a leading institution for tropical plant conservation in SE Asia. Marina Bay Sands is also the home of the famous Sky on 57th Restaurant. Call ahead for reservations and if you have the time to linger over the many courses, It is highly recommended allowing Michelin starred Chef Justin Quek wow you with his tasting menu and FrancoAsian Fusion. Dinner is spectacular, the presentation is fabulous and “unique flavor combinations” are the key comments heard from patrons. After dinner request a spot on the deck which is always a prime place to be seen. Another not to miss eatery is the Din Tai Fung. This extremely popular spot has an extensive menu of both traditional and modern dim sum dishes. As you wait in line, you watch a team of chefs cooking and plating dim sum with almost robotic precision. As in most Asian restaurants the service is rather brusque but that won’t dampen your taste buds, the meals here are as adventurous as they are mouth watering! The little red dot, as Singapore is known, is somehow quaint in a cosmopolitan kind of way, which comes, in part, from the beauty of a cultural mosaic, where people with different ethnicities and beliefs not only coexist but invite you in and welcome you to explore this world-class city. This entry was posted in Asia & The Pacific and tagged marina bay sands hotel, merlion, singapore, skypark singapore, The Marina Bay Sands, travel.